JERUSALEM – UNESCO declared Bethany Beyond the Jordan, on the eastern side of the Jordan River, as a World Heritage site and the location of Jesus’ baptism. For years, Israel and Jordan have been at odds as to which side of the Jordan River is the actual site of Jesus’ baptism, as both sides vie for the title to increase tourism. 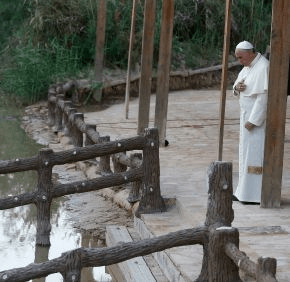 Israel upgraded its shoreline with changing rooms and a wooden deck access to the murky waters, while Jordan’s eastern shore has remained a sleepy site despite two papal visits. Father Alliata said ancient iconography shows Jesus in the middle of the river rather than on any of the two shores, and there are accounts by ancient pilgrims of marble columns in the middle of the river marking the site of Jesus’ baptism.